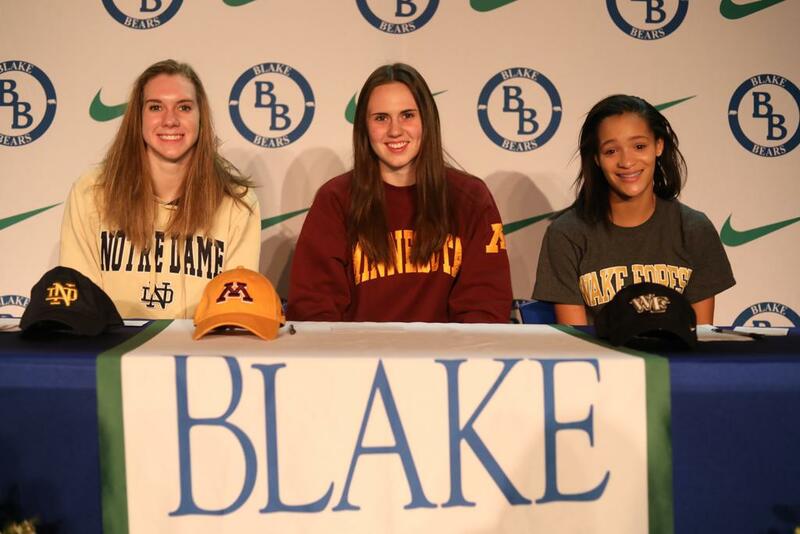 Balke seniors, Robbie Grace, Maddy Potter, and Madeline Wethington signed National Letters of Intent (NLI) last Wednesday in front of family, friends, teachers and administration. Grace, a State Champion in the long jump, a State Runner-Up in the 200m and a State 3rd place finisher in the 100m signed her NLI to compete at Wake Forest University. Potter, a 4x State Champion, twice in the 200IM and twice in the 100 Fly signed her NLI to swim at the University of Notre Dame. Wethington, a defensemen for the girls' hockey team, has been a member of three state champion hockey teams and has also represented the United States of America in multiple international events. Wethington signed her NLI to play hockey at the University of Minnesota. Congratulations to all three of these fantastic student-athletes! ©2019 The Blake School Athletics / SportsEngine. All Rights Reserved.